For over forty years, Annabel Trends have been making quality home linen, kitchen napery and accessories loved by people Australia wide. 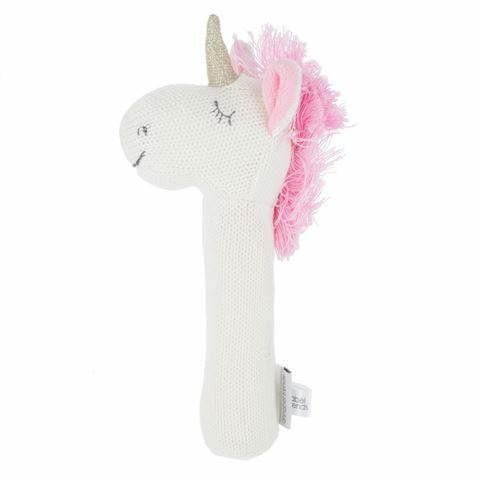 Their Australian-designed products are made with care and will look wonderful in your home.Well, now your child will have their very own unicorn to snuggle and cuddle whenever they please, with this Unicorn Knitted Rattle. Cosy to hold, this adorable little unicorn is made from soft polyester and rattles softly when shaken. Your child will also be delighted to discover that the body squeaks when it's squeezed, so they will have a blast making funny noises and cuddling up with their long-necked buddy. Suitable for newborns and older. Squeaks when the body is squeezed.